Huxley’s ingenious fantasy of the future sheds a blazing light on the present and is considered to be his most enduring masterpiece. I love the idea behind Brave New World and the moral issues it throws up, which I think are increasingly more relevant despite the book originally having been published in the 1930s. Love it. You might be forgiven for thinking in a few paragraphs time that I hated reading the book but I didn’t. Some of the writing is witty and there’s a tongue-in-cheek feel about a couple of the characters’ attitudes but, for all of its cleverness, there was just something about the book that didn’t have me dying to pick it back up whenever I put it aside. I may be opening myself up to accusations of stupidity but I can only assume that there was something about Brave New World that I just wasn’t getting. To me, it felt like a short story pushed way beyond its strength. I’ll keep saying it just so that I don’t sound like I’m moaning constantly but there are some solid theories behind this but very little character development or much in the way of a discernible plot. I don’t need my novels to be all action and snappy dialogue but I do expect something that will keep me wanting to turn the pages. If I wanted to read an essay on sociology, the perils of dictatorships and/or the pitfalls of excessive genetic engineering, I would. There appears to be a focus on Bernard Marx as the resident malcontent. Dissatisfied with perfection, Bernard is marginalised for complaining in a world where there is ostensibly nothing to complain about. Other than serving to highlight the fact that perfection might not be all it’s cracked up to be, there is nothing to Bernard’s character that I could identify with or was developed. I understand why I would be unhappy in the civilisation of Brave New World but Huxley never managed to mention why Bernard was unhappy. Why Bernard was much of anything, to be honest. There was a little more to Lenina, Bernard’s (at times unwilling) companion. Lenina is much more a product of her society and subscribes to many more of its ideals than Bernard does, even while she resists the simplicity a little bit by scandalously engaging in monogamy. The connection between the two, though, is shaky at best. I know that I sound like I’m going round in circles but it isn’t that the concept is off or that the writing is weak, it’s that I didn’t enjoy reading about the characters or the society; it was more like looking at a photograph of strangers in some exotic location. Interesting but not very engaging without context. After the first half and the bulk of the exposition on the modern society was done, I wasn’t sure that I was interested in where the story was going. The contrast between Bernard’s world and the Savage Reservation was a bit too obvious but the addition of Linda and John was welcome. The Directors talk readily about the repulsion they feel about the past and how promiscuity and drugs are the ways forward but there’s no back story as to why those attitudes in particular are the way to salvation. Why were the Directors so compelled to remove freedom of thought and replace it with obedience? Perhaps it’s supposed to be obvious and the evils of modern society are reason enough but I think part of my disgruntlement was because there just weren’t enough reasons to believe in the alternative reality. Overall: I can’t fault Huxley’s ideas but I think the execution leaves a little to be desired. 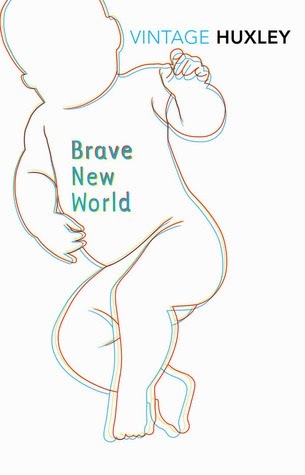 Brave New World is a relatively small 229 pages but seems longer; I’d hesitantly recommend it for its social commentary and fascinating political points but not for its qualities as a rip-roaring read. Take from that what you will.